Just a few yards away from the Basilica Minore del Santo Niño, the Magellan's Cross, found inside a small Chapel, is the Symbol of the Province of Cebu. It is a Wooden Cross placed by Ferdinand Magellan and the Spanish Explorers when they first set foot on the Province of Cebu. It symbolizes Roman Catholicism in the Philippines. 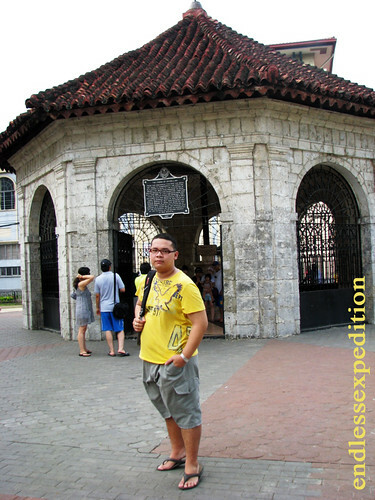 Ever since my Childhood days, the Magellan's Cross has long been my marker for Cebu. 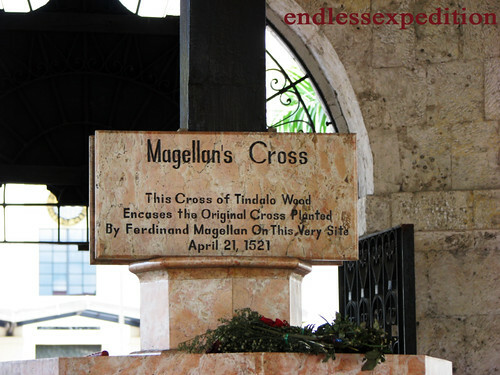 I told myself before that If ever I will be traveling to Cebu, the first thing I should go to is the Magellan's Cross because if ever I will not get the chance to see it, then I'm doomed, it's like I have never been to Cebu at all! So as we arrived at the Basilica for prayer and for some pictures, I asked the Security Guard just outside the church on how we can go to the Magellan's Cross from there. Then I was surprised to know that we need not have to ride a jeep nor have a long walk because the Cross is just a few yards away from the church, just beside it actually, at Magallanes Street (Magallenes, named after Magellan's Spanish Name) So as we walked along the road from the church to the Convent and till we reach this Arch like structure, there it was, the Magellan's Cross. They say that the Original cross is inside this Cross of Tindalo Wood to preserve and protect the Original Cross of Magellan which is said to be chipped out by Tourists before to be kept as souvenirs while some Locals say that the original Cross was destroyed or lost even during the Spanish Times and this was just made to commemorate the said Cross. Either way, what's important is how we remember the Christian Roots of the Philippines and the Magellan's Cross is a big statement to that. As tradition, whenever we travel to different places around the country, the first thing we look for and visit is the town's or the City's church. So on our first day at Cebu City last August together with my older brother and cousin, after a couple of hours' rest at the Hotel, we went directly to the Santo Niño Church or officially known as the Basilica Minore del Santo Niño. 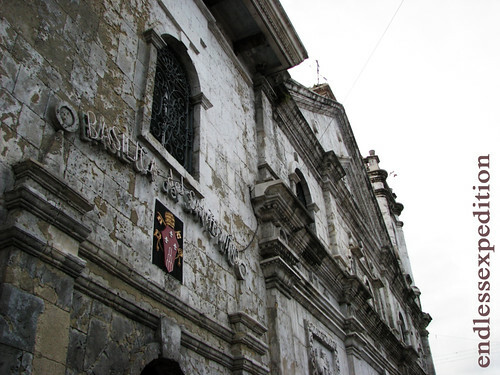 It is the oldest Church in the whole country built on 1565 by the Augustinian Priests and later rebuilt into hard stone by the Governor of Cebu on the 18th Century. 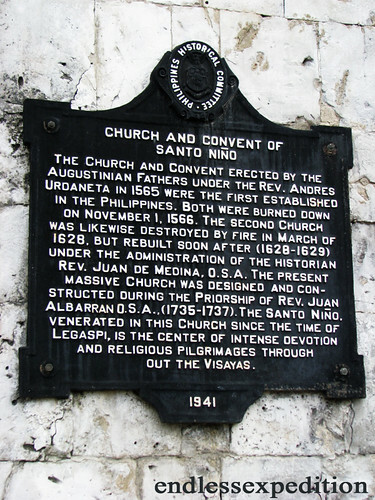 As stated from the Marker, the Basilica Minore was burned down twice during the 16 Century but was built up again ad again from then on. 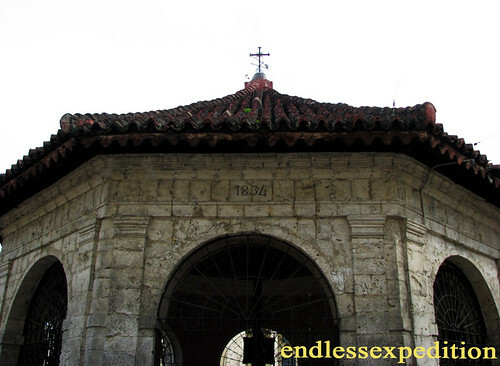 The Convent is situated just beside the Church where the friars lived before and part of it is now converted into a Museum where tourists and travellers can visit and experience the History not just of Cebu City but the Christiandom of the Ciudad. From our Hotel, we took a Taxi and went directly to the church. 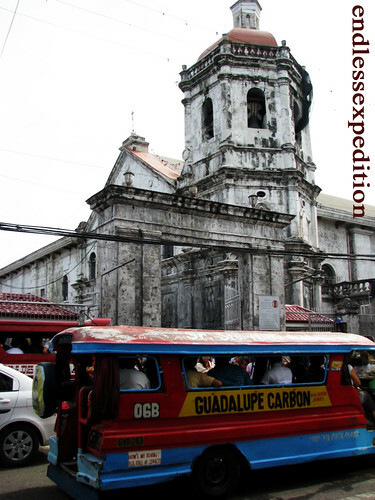 All you have to say to the Driver is to take you to the Santo Niño Church and you'll be there in a breeze. Jeepneys are the primary means of transportation in Cebu but it might be quite hard since these Jeepneys are number coded but of course, the Friendly locals will truly be nice to give you the directions on what Jeepney to ride! 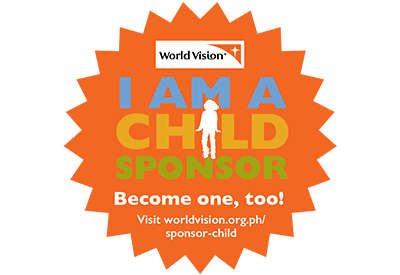 But you should always remember to be careful because the Cebu Cathedral is also located directly in front of the Basilica so you should be specific as to what Chrch you would like to go to but for us, of course, we visited both. Also, the Magellan's Cross is also located just behind the Basilica so it's like three Historical Attractions in one place! Many locals and tourists alike visit the Basilica to pray and of course to visit the Santo Niño de Cebu, the original image of the Child Jesus brought the the Magellan Expedition during the Spanish discovery of the Philippines. The Santo Niño de Cebu is housed inside the church and devotees can visit and pray to the Santo Niño. The line to the image was quite long during our visit but of course, it was all worth it when we finally saw the Santo Niño de Cebu. We took a while and prayed and we went off to give way to the next devotees. 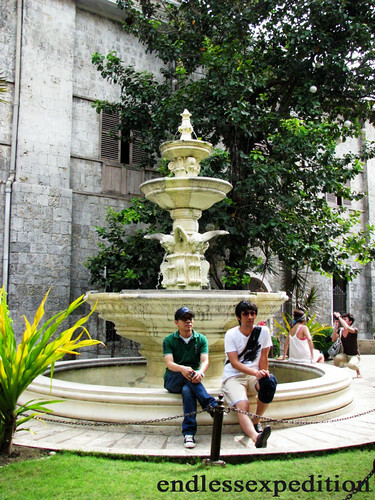 Korean Tourist taking some photos with the fountain inside the Convento. Many tourists visit the Basilica Minore del Santo Niño not just to venerate and pray to the Santo Niño but also, to capture the beauty and history of the Church. By experience, I did not just saw history through the walls and the paintings and the memorabillas on the church but I really felt like I have been swooped into the Spanish Era of Cebu City. So if you are planning to visit Cebu City or the Province of Cebu itself, be sure to make Basilica Minore del Santo Niño your very first stop. Daghang Salamat Cebu!